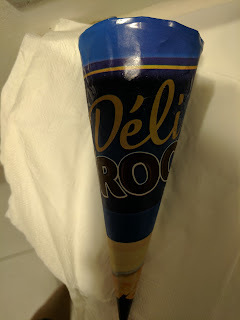 For the past few weeks, I've been posting about the assorted ice cream I found while visiting my Paris office, like the Mars brand ice cream bars and slightly more interesting Trufo bars from Kalise. This time however, I don't know who the manufacturer actually is. Doh. The best photo of the packaged product I have is this, and, well, no amount of Google searching was able to help me figure it out. Please help dear readers, do you know what brand this is? 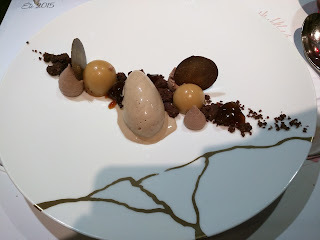 "Cône de glaces au chocolat et a la pistache avec inclusions de pèpites de chocolat, décor" de pistaches hachees grillèes." 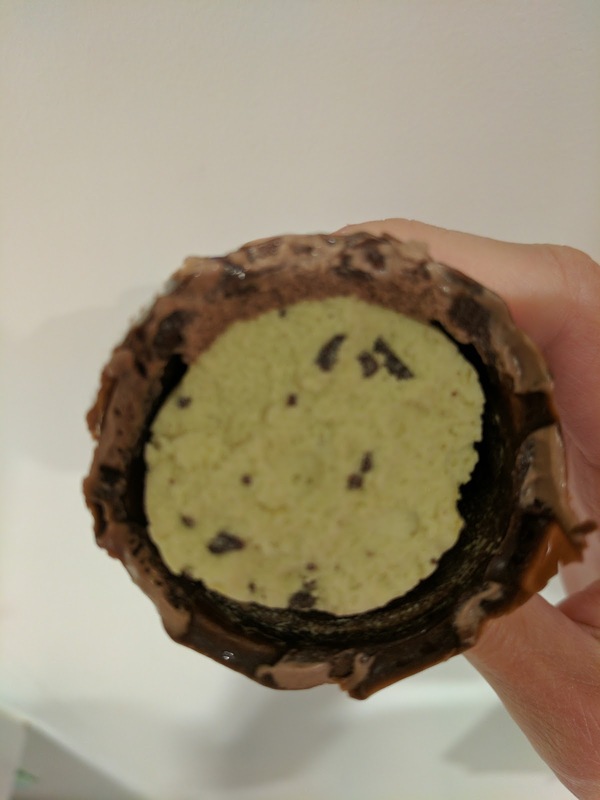 I didn't see the flavor listed on my wrapper, so I didn't realize I had selected chocolate pistachio, until I opened it up. The top "scoop" was mild milk chocolate, decently creamy, topped with pistachio bits, er, "pistaches hachèes grillèes", chopped roasted pistachios. 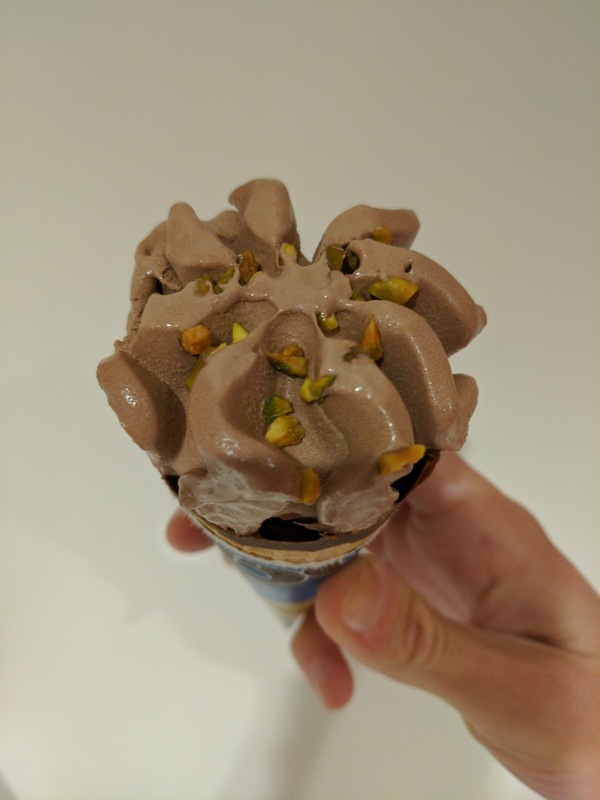 The rest of the cone was filled with the pistachio ice cream, which actually had chocolate chips in it, "inclusions de pèpites de chocolat". It was ... fine, not particularly creamy, but not awful. The cone was lined with chocolate and was a standard sugar cone. Overall, this was not bad, but not notable in any way. A few years ago, when I visited Tokyo, my office had a special event the day I arrived: a melon pan popup. I was entirely unfamiliar with melon pan, but I was jet lagged, and hungry, and all of a sudden sweet pastries were in front of me. Everyone around was buzzing with excitement. Apparently this wasn't just ANY melon pan, it was the best in all of Tokyo. I grabbed a melon pan, a bit concerned that it said "melon", since I'm actually deathly allergic to watermelon and generally allergic to most melon, but I couldn't resist. Foolish, but I blame the jetlag. I took one bite, and I was hooked. What was this thing?!! It was sweet, fluffy bread coated in a crispy ... sugar cookie? I know this description sounds crazy, but that is really what it was. Now, I don't really like bread. I just see no point to bread in general ... I love baked goods, it isn't that I'm carb adverse, but just bread? Meh. Put it in some bread pudding, and then we are talking! But why would I want just bread, even if sweet? And I don't really like cookies. But somehow, if you combine them, magic happens. It was light and fluffy, it was moist, it was crunchy, it was sweet. I think it was matcha flavored, it was certainly green. It was also insanely huge. I saved some for breakfast the next morning, and it delightful then, perfect alongside my coffee. 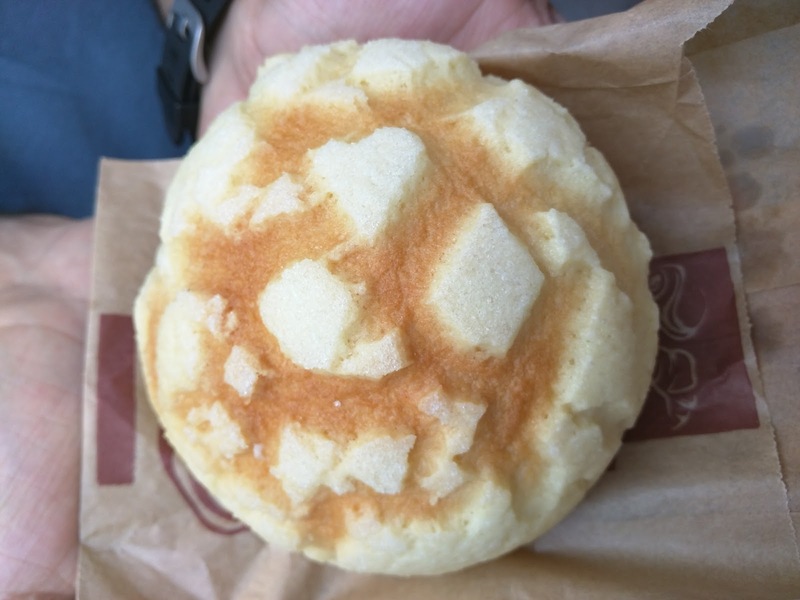 This experience left me totally fascinated by melon pan, and tried to seek it out when I returned to San Francisco, but I've never found anything like it elsewhere. Eventually, I sorta forgot about melon pan. And then I started researching boulangeries in Paris. And found Aki Boulanger. 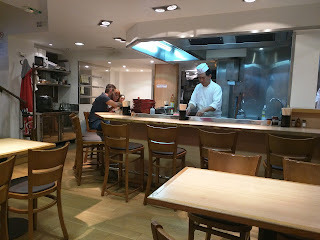 Aki Boulanger is the sister boulangerie to Aki Restaurant, which I visited for okonimiyaki one night. 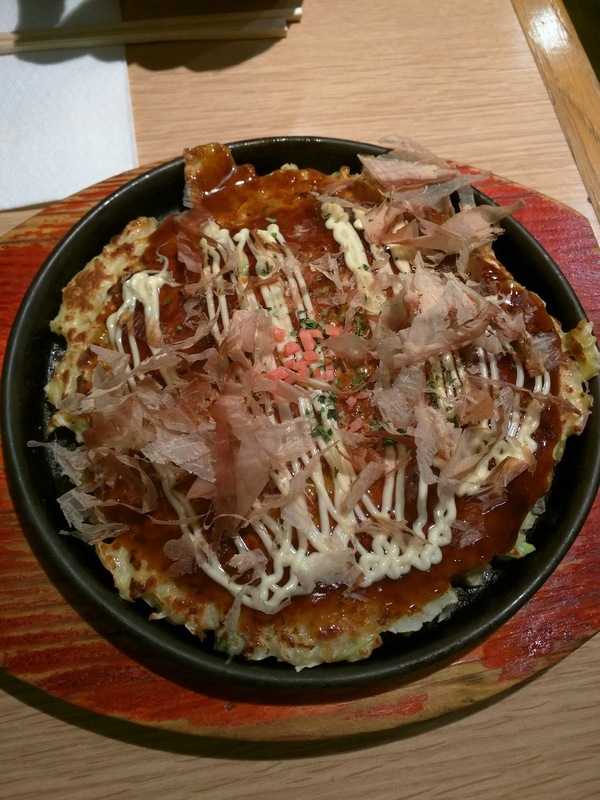 After our okonomiyaki, I couldn't resist swinging in. Because ... they have melon pan! And their melon pan is available in many flavors: plain, chocolate, matcha, caramel, even strawberry. Or it can be stuffed with chocolate ganache or cream. OMG. Oh, and did I mention, it gets universal great reviews? Tough for a boulangerie in Paris. Aki Boulanger offers a slew of other temping sweets too, often traditional Parisan pastries with a Japanese twist (like red bean, yuzu, or matcha). I almost couldn't pass up the Aki Brest, a Japanese spin on a Paris-Brest with black sesame cream filling instead of praline. But in the end, I had to go classic and stick with my game plan: melon pan. Aki Boulanger is classic boulangerie setup, with a long display of tempting treats, plus a menu for drinks to go alongside (classic espresso beverages, but also a slew of matcha drinks). Items are available to eat there at a few small tables inside and on the sidewalk, but most folks take items to go. Goods are a bit cheaper if you get them to go - bonus! I went simple: classic melon pan. If it were earlier in the day, I certainly would have opted for matcha melon pan, but I was avoiding caffeine in the evening. I almost went for the strawberry just because it sounded unique. Ojan said I should get the caramel. I considered the filled ones, but in the end, I really just wanted the basic one that I remembered from Tokyo. I clutched my bag with glee. Yes! I finally found melon pan! Sadly, it didn't quite live up to my memory of the amazing melon pan I had in Tokyo. The dough was light, fluffy, and sweet, so that part was what I wanted. But a signature component, the crispy sugar cookie-like crust, didn't. It was only slightly crispy, and not really sugary. It did have the look of a melon like it should, but it was fairly soft on the outside. I wonder if it was better when fresher earlier in the day? It was 8pm, on a very, very hot day, perhaps it got soft in the heat? Regardless, it was fine, it was still sweet bread, but the aspect of sugar cookie crust was lost. It was also only about half the size of the one I had in Tokyo, but that I appreciated. The Tokyo one was a monster, and this was still plenty large. 2€ price was reasonable for a fresh baked good. If I was in Paris for longer, I probably would have returned earlier in the day to see if quality improved, but there were too many delicious things to eat during my short stay in Paris, so I didn't risk another precious meal slot for this. I've only been to Paris twice, both times within the past year. 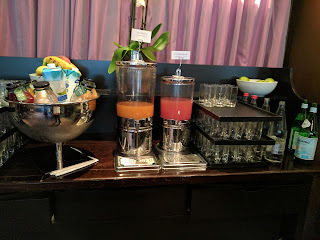 The first time, I stayed at The W Hotel Opera, where, besides the jam, the breakfast really failed to impress (although the hotel itself was great). So on my second visit I decided to try another Starwood property, this time, the Westin. Breakfast is buffet style at Le First, the restaurant on the ground floor. 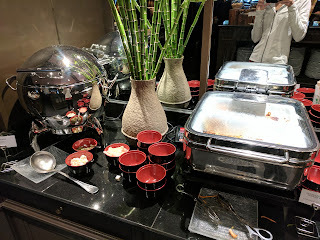 It was one of the best breakfast buffets I have ever encountered, on nearly every dimension: extensive options, always fully stocked, friendly and attentive staff, and of course, tasty food. As I said, options are extensive. If you want to be healthy and have some hot porridge, yogurt, and fruit, you certainly can. If you want to go French and have a baguette with butter or cheese, or crepes and ratatouille, you can. If you are feeling Asian inspired, and want miso soup and teriyaki salmon, also an option. If you prefer things simple, and opt for toast, bagels, and cereal they have that too. Generic American breakfast of scrambled eggs, bacon, and sausage? Sure. But if you want to be, uh, Julie, there is hot danish bread pudding, cheesecake (! ), and absolutely stunning pastries. 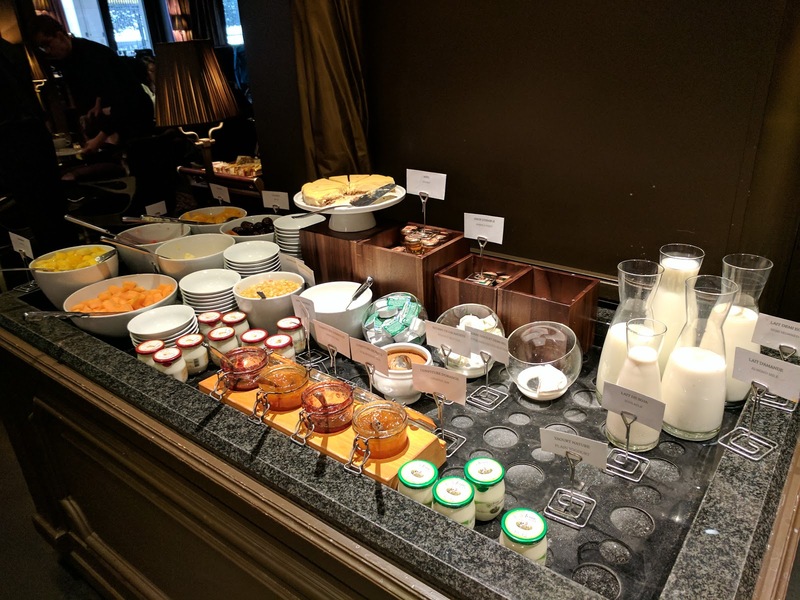 After all, you aren't in Paris at a breakfast buffet too many days a year ... right? Go big or go home? Which, uh, I did, for a full 4 glorious days. 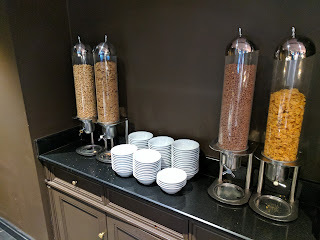 I highly recommend this buffet, if you can't tell. 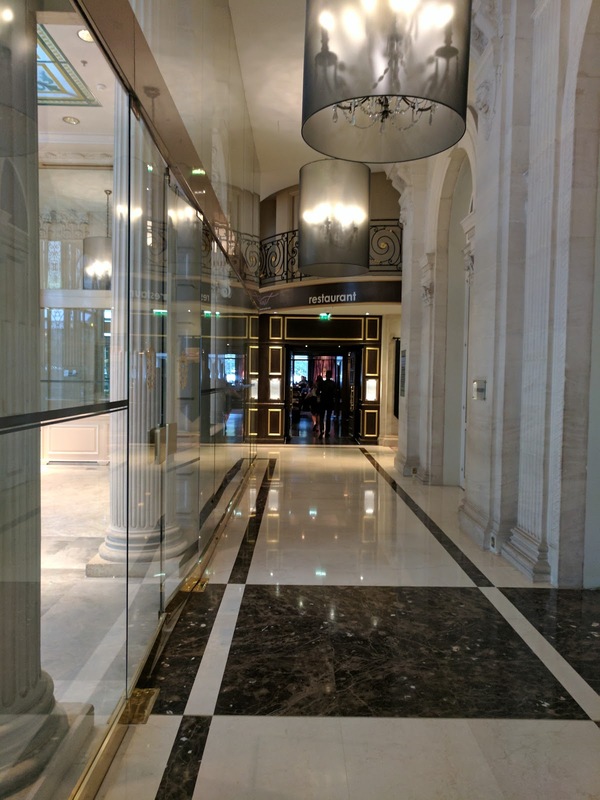 The Westin Paris is an impressive place. It was built in the 1800s, as the premier luxury hotel in all of France. It is a full block large and quite a maze. It was used as a military hospital at one point, and became a Westin in 2005. It is the definition of elegant. 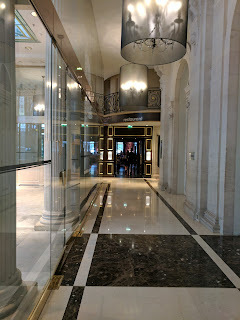 To reach the restaurant, you walk down a long marble hallway, shiny and glistening. The interior is quite regal - dark tones, lots of deep purple and gold, curtains everywhere. Elegant doesn't normally equal comfortable, but, here it does. 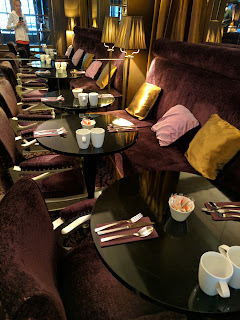 The seats are all padded and it was very easy to stuff myself, and then just settle into these seats in blissful food coma, happy to not move besides lifting my coffee cup. Tables were set with paper napkins, but they were purple too. Silverware, mugs for coffee, and sugar/sweetener completed the place settings. I had the buffet, usually 39€ each, but was the option I selected for my Platinum benefit, so, included in my stay. Once seated, literally immediately, I was always offered coffee or tea. I went with coffee, and it was ... ok. Fairly harsh. Coffee was refilled regularly by a server who roved around the room. Every day, I tried the regular coffee, and every day it was really acidic. 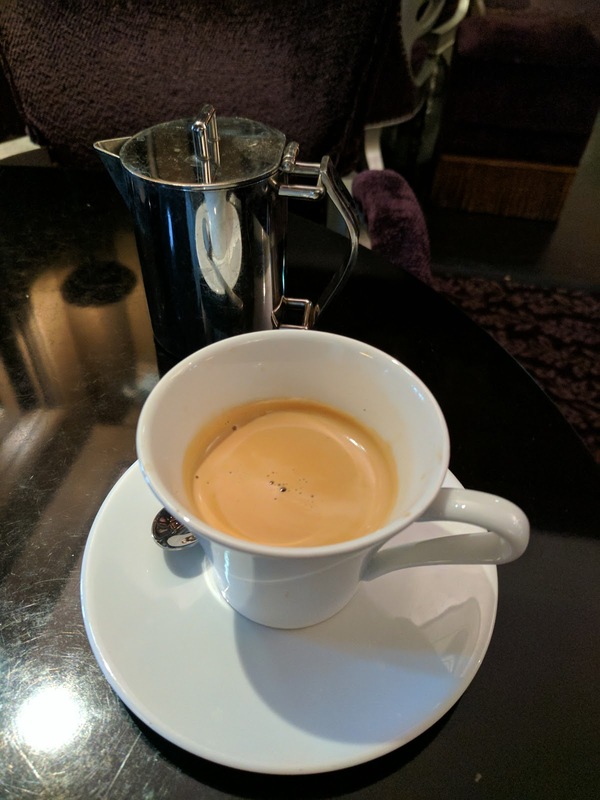 Is this just Parisian coffee? After awhile I switched to decaf, which I needed to order from a server. "Decaf espresso? ", he asked. "Uh ... Americano?" I offered. He brought me a decaf espresso, and my own pot of hot water to mix in as I pleased. Perfect! I tried the decaf another day, and again, it was better than the regular. Such a rare thing, not that it was amazing, but it was perfectly drinkable. 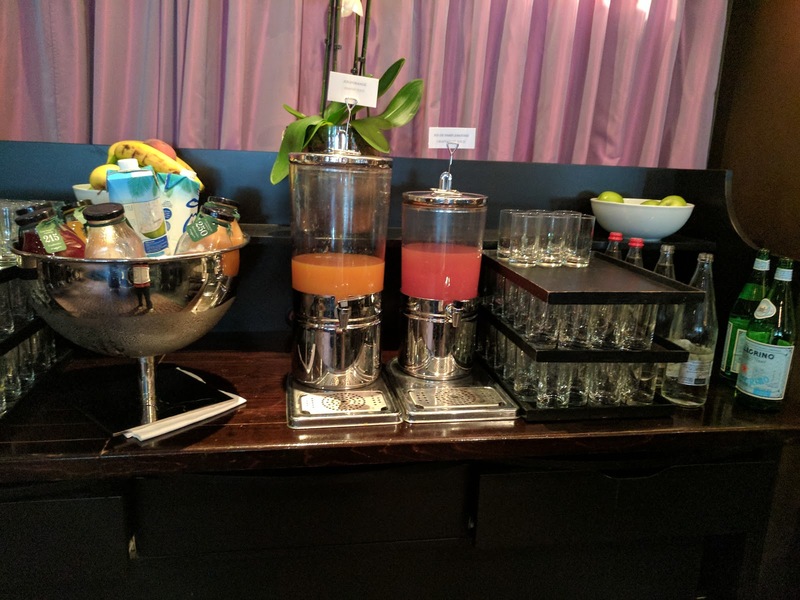 On the side was a self-serve cold drink station, with still water, sparkling water, grapefruit and orange juice in dispensers, and other juices, even coconut water, in a bowl on the side. Next was a tea station, with fancy Jing teas, but only 3 varieties. They had a bunch of herbs to mix in on the side. 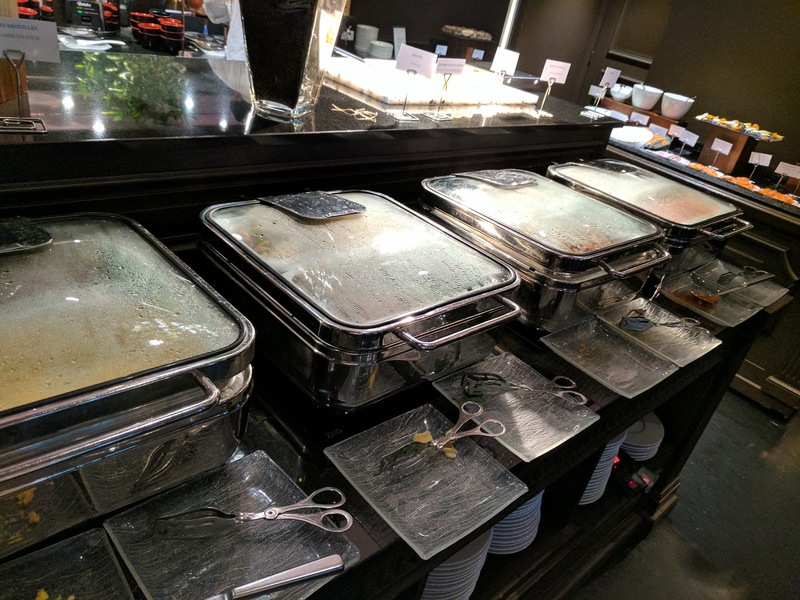 Hot foods ranged from American to Asian to French, all served buffet-style. You could also order made-to-order eggs, but no one tells you this and there is absolutely no indication it is an option. Not that I care, as I'm not into eggs, but worth noting if you are. 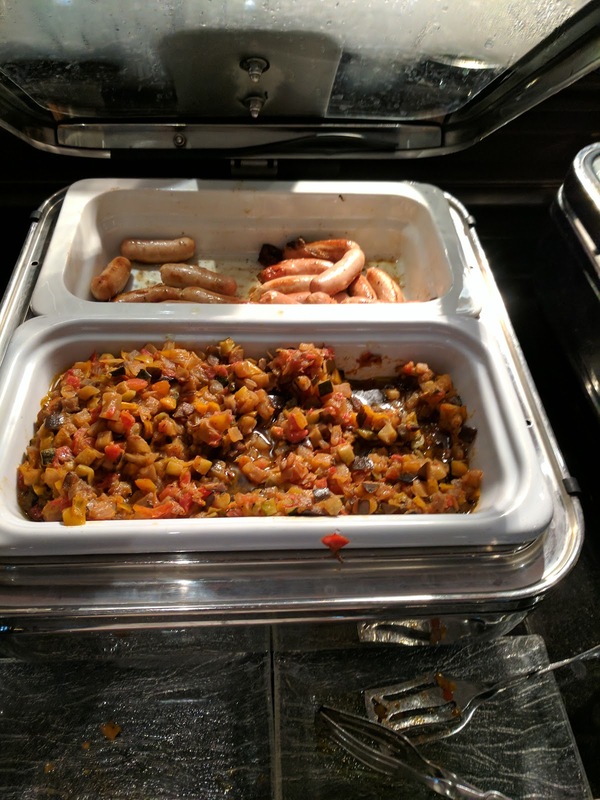 The main hot buffet contained all the items you'd expect. 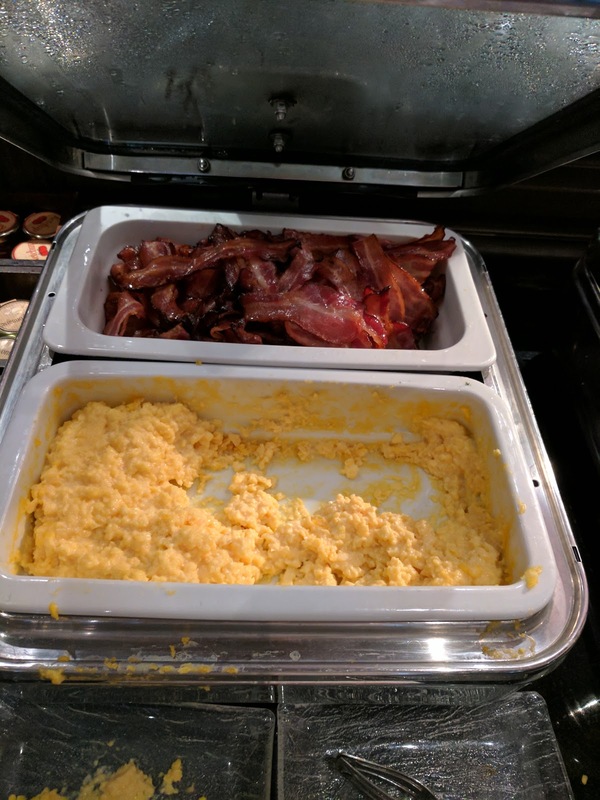 Standard scrambled eggs and bacon. Sausages to complete the "American" style offerings. Next was veggies, in the form of ratatouille. Now we were getting more French. The potato option was roasted potatoes. More veggies included sautéed mushrooms and flat broad beans. The mushrooms were unfortunately cold the day I tried them, but, I really liked having assorted wild mushrooms, well seasoned, and something savory with my sweets fest. Baked beans completed the "European" style options, and some vanilla crepes bring us back to the French influence. No pancakes, french toast, or waffles for hot carbs. The crepes were ... ok. Buffet crepes. Thin style, crispy, a bit cold. Not worth it given the other options. 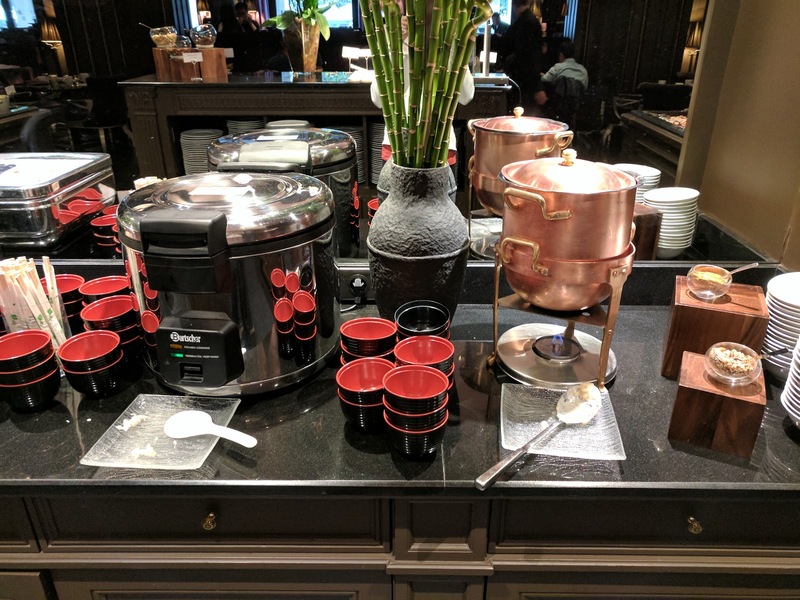 On the other side is an oatmeal station, in a beautiful copper pot held over of a flame. Mix-ins like chopped pecans and cinnamon were on the side. I tried the oatmeal, and it was really just a pot of soupy mush. Even with mix-ins, it failed to impress. A rice cooker started the Asian hot foods area. Asian Veggies, Chicken, Glazed Salmon, Miso Soup. The Asian station is rounded out by miso soup (with add-ins in little bowls in front), plus glazed salmon, chicken, and stir fried veggies with noodles in chafing dishes. Moving along to the cold items, things got far more interesting. Ok, well, cereal isn't interesting, but, was there as an option for those who want their simple cereal breakfast. Corn flakes, cocoa crispies, corn pops, wheat flakes. Fruit, Yogurt, CHEESECAKE, Condiments, Milks. To go with the cereal, or perhaps just to drink, was a large selection of milks, including skim, soy, and even almond milk. This was a big step up from everywhere in Portugal (where I was prior to Paris) where only one kind of milk was offered. They were all labelled too. Next to this was the butter selection, fancy individual wrapped butters, with or without salt. There were four types of jam in pots (raspberry, strawberry, apricot, and orange). A pot of peanut butter. Individual jars of honey, maple syrup, and even chocolate hazelnut spread. Then came yogurt, fancy glass jars of yogurt (plain or fruit), plus one big bowl of plain yogurt. Fruit toppings, like stewed prunes, oranges, grapefruit segments, melon, pineapple, and mango. I tried the plain yogurt, it was fine, but nothing very special. I topped it with jams and mango. The jams were not anything particularly interesting, good quality, with real fruit, not just Smuckers, but not my mom's homemade jam. The mango wasn't actually ripe fresh mango, instead it was somewhat stewed or poached I think. And then ... CHEESECAKE. Yes, CHEESECAKE. For breakfast. Oh be still my heart. The cheesecake was fantastic. A thick, buttery, sweet, graham cracker crust. Super, super creamy, lemony cheesecake. At first, I found it too lemony, as I don't really like lemon desserts. The first day, I ate the crust alongside my coffee life a biscuit, and really enjoyed it. Later ... I came back to the lemon flavored creamy cheesecake, and ate it more like a pudding or yogurt, and really liked it. It is amusing, but, once I stopped thinking of it as cheesecake, I liked it. I'm glad I discovered this on my first day. I had a small slice of cheesecake every morning. I never liked it as a complete package, but, whenever I ate the crust off first, with coffee, and then the creamy lemony pudding, I actually liked it. It varied in quality though, some days the crust was soggy, and other days the cheesecake was weeping. I think it must have been frozen, and just how well it was unfrozen varied. Still, it was tasty, no matter. French Cheeses, Charcuterie, Smoked Salmon, Salad, Hardboiled Eggs. 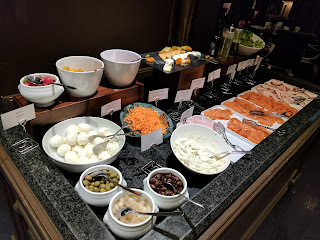 The final cold items station had makings for salad (lettuce, carrots, cherry tomatoes, radishes), two types of olives and onions, cucumbers in yogurt, and hard boiled eggs, three (!) different types of smoked salmon (although no capers, lemons, etc), sliced ham, turkey, and chicken, and a stunning french cheese platter with dried fruits. The cheese platter was clearly a showcase for the restaurant, with hard cheeses and soft cheeses, including a ridiculously gooey super stinky triple cream with a washed rind. This was replenished constantly. I didn't find myself gravitating towards the cheeses though, they were just never what I wanted at breakfast. One morning, about 2 weeks into my trip, when my body was clearly craving something besides sweets and carbs, I actually made a salad. For breakfast. Which is ridiculous for many reasons, I never make salads, and I certainly don't eat them for breakfast. But, I needed veggies. The gem lettuce was fairly fresh and crisp, and the radishes crunchy and refreshing. Only balsamic and olive oil were available for dressing though, so, that wasn't quite what I wanted. And now, getting to the good stuff. The baked goods. 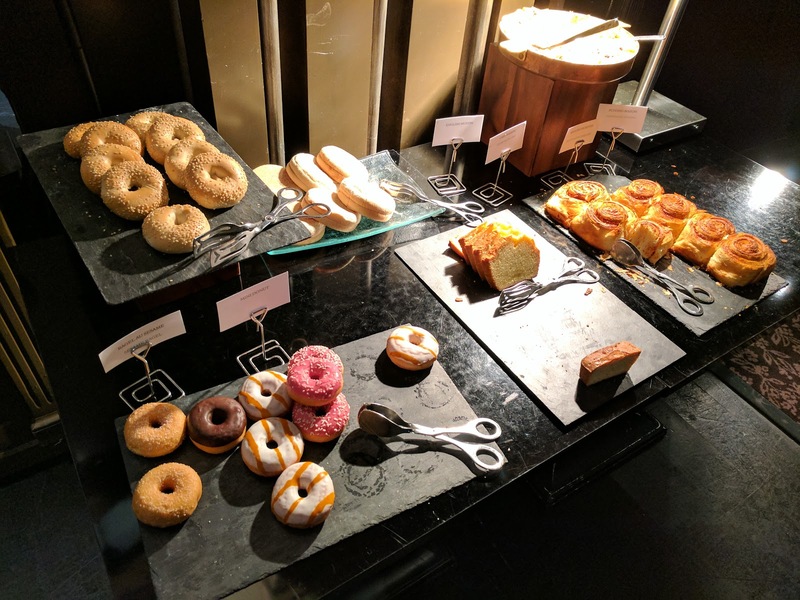 Sure, breakfast buffets don't normally have very good baked goods, but, well, we were in France. 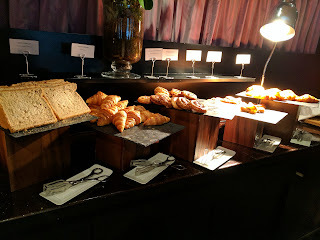 I had hopes, although not necessarily expectations, since the breakfast pastries at the W in Paris were so poor. That was not the case here. They did a fantastic job with the house made items. To start, on the side was a cute little gluten-free corner, with separate cereal and bread. 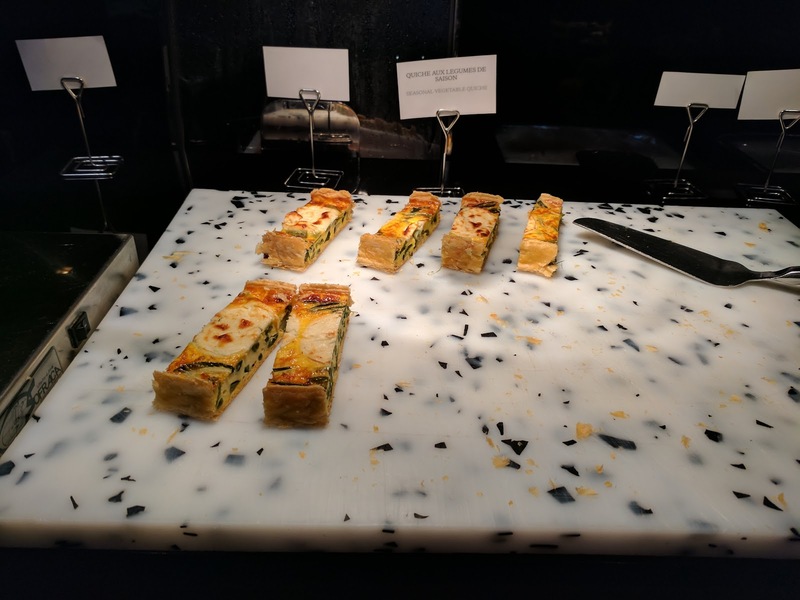 Next came quiche, presented on a marble slab. I tried a small piece on the final day. It had spears of asparagus in it, but was still quiche, not an item I really like. The puff pastry crust was decent. 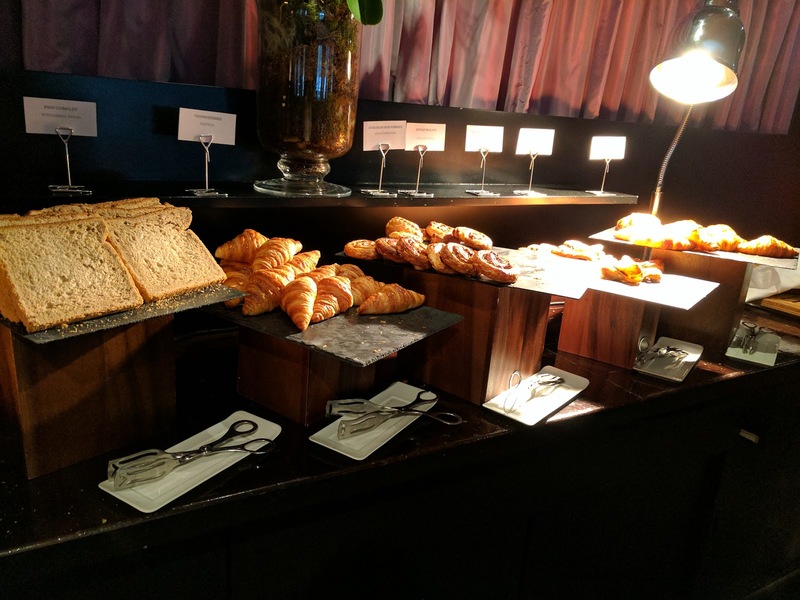 I adored the fact that they kept the croissants under a heat lamp. A toaster was available on the side as well. Continuing along were the baked goods for the Americans: bagels and english muffins, pre-sliced and ready for toasting. There was also some kind of pound cake that I never tried. And then, the good stuff. On the far right, were some croissant-like buns, labeled "puff pastry brioche". They were almost like kouign-amann, just, not quite as buttery and caramelized on the outside. Ojan took one look and asked if they were kouign-amann. These were clearly made in house, separate from the rest of the croissants, danishes, and whatnot. They were perfectly flaky and buttery. The outside was a bit caramelized and crispy. I did find them a *little* bit dry, but slathering one in some chocolate hazelnut spread quickly fixed that. I grabbed one most days, always thinking it was so close to great. Really buttery, flaky pastry, but, just a bit too dry. Vanilla Glaze Sprinkle Topped Donut. The donuts looked very familiar, and I realized that they were exactly the same as the ones I raved about from the Sheraton Cascais. 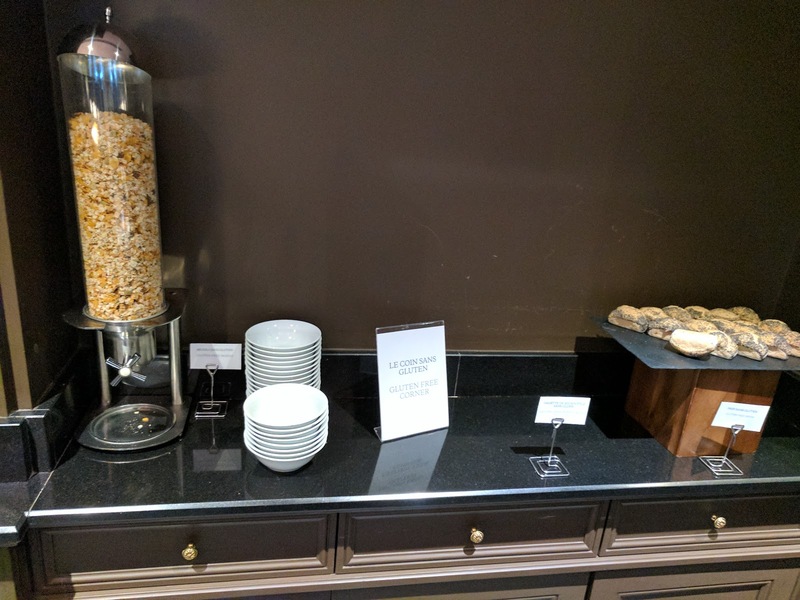 Clearly, Starwood uses a consistent supplier for some of the baked goods. While the donuts were a highlight in Portugal, there were so many other amazing things in Paris, that it took until the final day of my visit to finally try one, which, uh, I grabbed on my way out the door because I couldn't resist. I selected the one that wasn't on offer in Cascais: a vanilla glaze with colorful round sprinkles. It was basically exactly the same as Cascais - a soft, sweet dough, not fried, and actually pretty good. This one was not filled. I really liked the sweet vanilla glaze and crunchy toppings. I gladly would have eaten more of these, but, there were too many other amazing things. And then there was this. Yes, croissant bread pudding. Also kept hot under a heat lamp. I love bread pudding. I love it for breakfast or for dessert. I love it sweet or savory. It is one of my favorite dishes, particularly when hot, particularly when topped with whipped cream or ice cream. But this was breakfast, and although I did want whipped cream to go alongside, I think I'm glad they didn't provide it, given just how heavy the rest of my "breakfast" was. Did I really need whipped cream on my mound of custardy bread pudding when I also had a slice of cheesecake on the side? Yeah, I didn't think so. 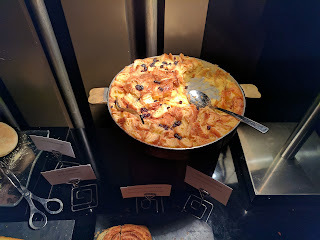 That all said, I'm *very* picky about the style of bread pudding that I like. I don't like it dense and homogenous. I like to find individual chunks of the bread used. Bonus points for using brioche, croissants, danishes, and the like. 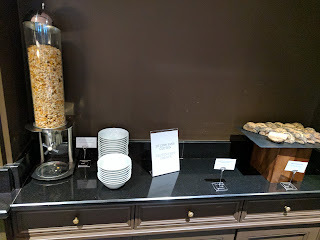 It was labelled "housemade pudding", and I was thrilled to discover that it was made from croissants and danishes, perhaps actually the croissant buns that I enjoyed? It was very close to my ideal style, super moist and custardy inside, a bit crispy on top. The base flavor seemed to just be vanilla/cinnamon, which was fine for breakfast. In the mix were some currants. Not what I'd pick (nuts are always better in my mind), but, still, this was fine. I ended up adding pecan bits from the oatmeal station to get my fix. I really loved the bread pudding. Custardy, moist, crispy, decadent danish bread pudding. For breakfast. I liked it even more when I drizzled some maple syrup over it, but to be honest, that wasn't necessary. I had this every morning. I went back for seconds every time. I knew it was horrible nutritionally. And yes, I had a big serving of bread pudding, AND a brioche croissant bun, AND a small slice of cheesecake. For "breakfast". Every day. It was worth it. I promise I ate salad and fruit for lunch. 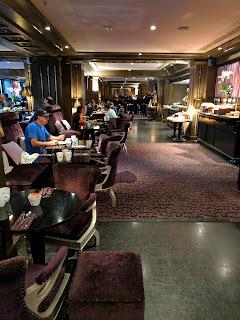 Over the years, I have been fortunate to visit several of Joël Robuchon's many Michelin starred restaurants around the world (he has 28 stars worldwide! ), like the very solid meal we had at the casual 2 star L'Atelier de Joël Robuchon in Tokyo, or the one starred L'Atelier in London, or the kicked it up many notches and far more innovative, also two starred, dinner at La Table de Joël Robuchon, also in Tokyo. So when I saw that there was a L'Atelier in Paris, I knew I needed to work it into my agenda. We opted to visit for lunch, as the lunchtime prix fixe was one of the most reasonable Michelin starred meals I could find in Paris (and, Paris sin't exactly hurting for stars). 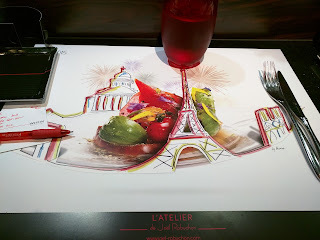 The experience was everything I've come to expect from the L'Atelier brand: an open kitchen where you could enjoy watching the elaborate plating, a very well crafted menu with perfect execution (but not necessarily the most exciting), and a highly consistent experience. Its like McDonald's in that way. We had a very good meal, at a price that is just unbeatable. 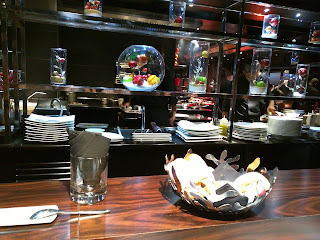 I'd gladly return again when in Paris, and will continue to seek out more Joël Robuchon restaurants worldwide. When you enter, the first thing you see is a very fancy foos ball table. Yes it works, and has a ball, so you can play. I'm sure there is a story behind this, but I didn't look it up. 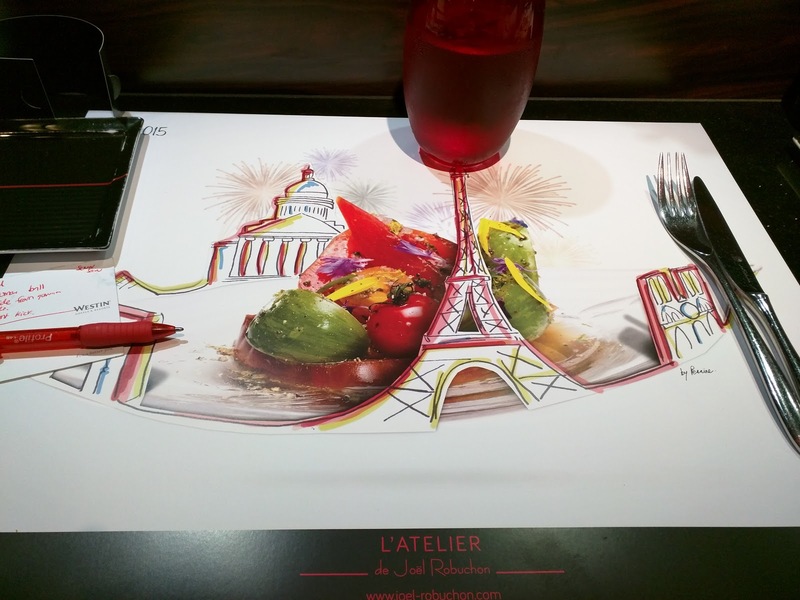 I didn't do much research on this restaurant, since I pretty much knew what to expect from the L'Atelier de Joël Robuchon brand. After our meal, I convinced Ojan to play with me. The most shocking thing about it? 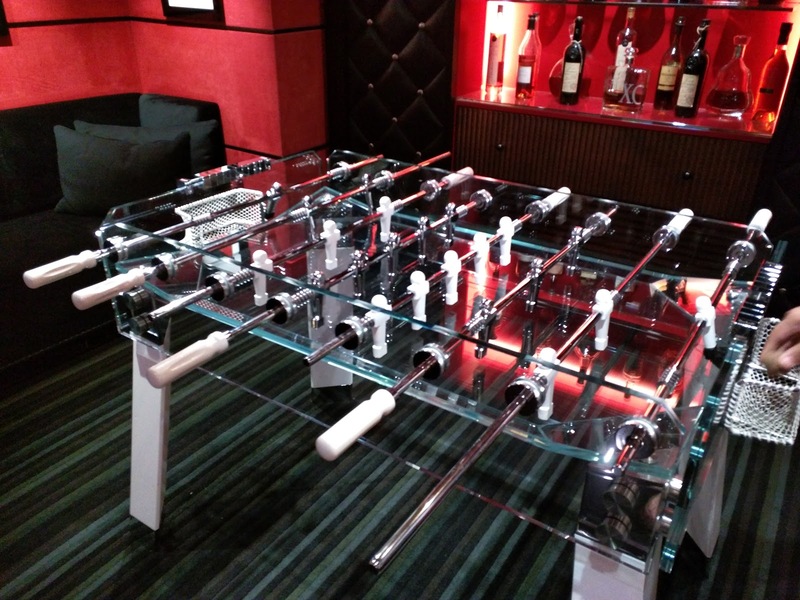 It was really quiet, which you wouldn't expect with all the plastic and metal parts. Classic L'Atelier de Joël Robuchon Red & Black Decor. A few more steps into the entrance, and we were greeted by a very familiar decor. I instantly felt welcomed and at ease. In a city where I couldn't read any signs, and I felt like a fish out of water, suddenly, I knew this! Everything was red, black, and glossy. While not exactly the same as either of the other L'Atelier de Joël Robuchon locations I visited in London or Tokyo, it was pretty much the same esthetic. I was amused by how comforting this felt to me, in the same way that I'm sure places like Starbucks or McDonald's feel to others. Familiar, safe, something to rely on, no matter where in the world you are. 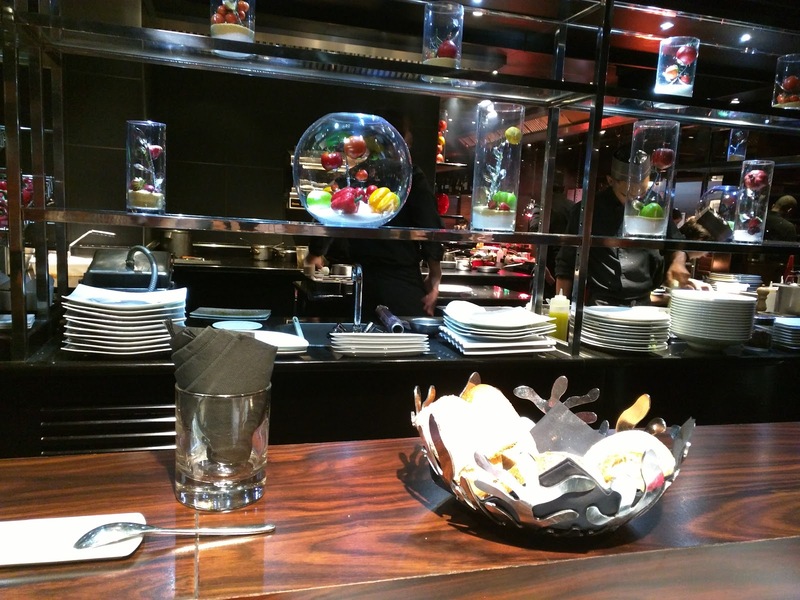 Like all the L'Atelier de Joël Robuchon locations, the concept is counter seating around the large open kitchen. There was a small side (private?) room as well, but basically everyone sits at the counters, served by waitstaff from behind the bar. 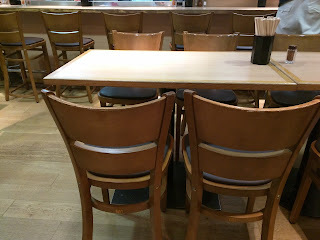 Bar seating isn't the most comfortable, but they did have padded barstools and purse hooks, which alleviate a lot of the discomforts normally found in bar areas. As always, I loved watching the kitchen. 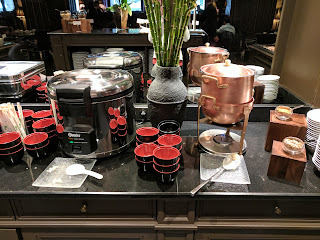 I like watching cooks in action in general, but at L'Atelier de Joël Robuchon, they take it up so many notches that you can't help but be fascinated. Even Ojan got engaged a few times to watch. This kitchen runs like a finely tuned, extremely perfectionist, machine. The number of staff is a bit daunting. The ratio of diners to cooks couldn't have been more than 2:1. And each staff member is busy. But never frantic. That was one thing that struck me. Everyone was working, hard, the entire time, but they never were rushed. No one was running around. They were also fairly quiet. Focused, precise in their actions. Even more amazing was watching a cook work on a particular dish. Say, a salad. First, he or she would prepare the mise en place ... for a single salad (or two if there were two orders in at the same time). But not a big batch. That is, a single radish would be sliced. Two tiny tomatoes. Etc. Each component would go into a bowl. And only then would he start composing the dish. Different elements were all seasoned individually. There wasn't just a bunch of dressing mixed in, or a sprinkle of salt and pepper at the end. So incredibly deliberate and precise. There were lots of little tweezers in use. The individual care went into every single ingredient, not just those where you can argue that the freshness obviously matters like with fresh, raw vegetables. Even the sides, like frites or mashed potatoes, were done to order. Yes, a single order of fries was fried at a time, a single tiny bowl of mashed potatoes painstakingly passed through the sieve. You would think that this would make for slow service, but given how many cooks there were, the pace of the meal was absolutely fine. I wouldn't have wanted anything faster (or slower). Speaking of service, it was good. 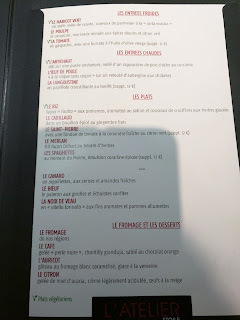 Only a French menu was provided, but our server happily ran us through the entire menu in English, as she did for many other diners. She was perfectly pleasant when we ordered the cheapest menu, didn't add any upgrades, or even order wine. Our dishes were cleared soon after we finished, never so fast we felt rushed, but clutter was never left around. It isn't the fine dining style with someone who comes to brush the crumbs up after you, and when I went to the bathroom my napkin wasn't re-folded for me, but really, I prefer this casual but attentive service, it is much more comfortable. The placemats were pretty cute, made from a hard paper, with a sketch of the Eiffel Tower on them, fitting given our location in Paris. Behind that was a sketch of a bowl of produce, which matches the decor of the restaurant as well, as it too had the signature (fake) fruits and vegetables in glass displays everywhere. (I still think the produce looks incredibly real, especially the bell peppers, so don't think this is a tacky way to decorate). 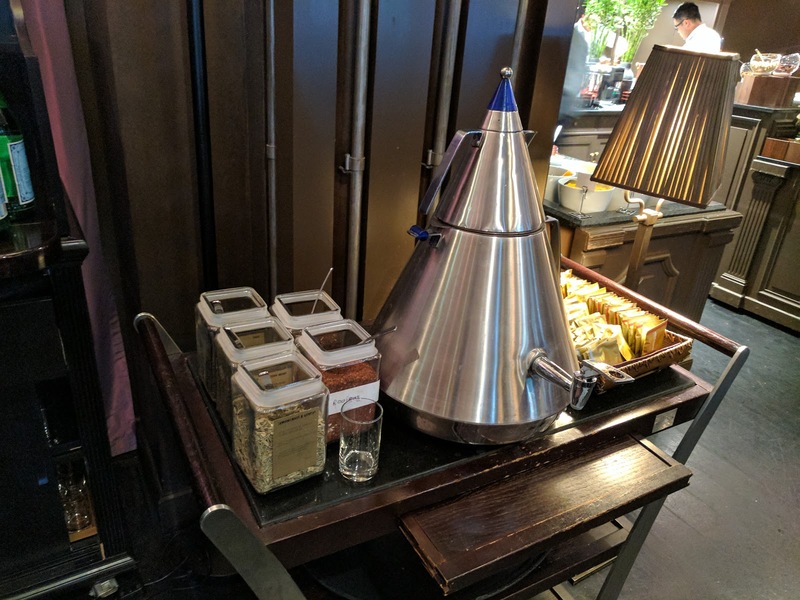 At lunchtime only, L'Atelier offers the best valued Michelin starred dining I have ever found (which I'd say if they had only 1 star too, but it totally insane for a 2 star place!). You just don't see pricing like this ... anywhere. For 44€, you get a 3 course meal (starter, main, dessert). If you'd like more, for 54€, you can add a second starter, plus coffee or tea. Or for 84€, 2 starters and 2 mains. That sounds too good to be true, right? You might think that that price means that the menu is fixed, and you have no choices. Or that the portions are tiny. All not true. You get your choice for each course, and you have many options. 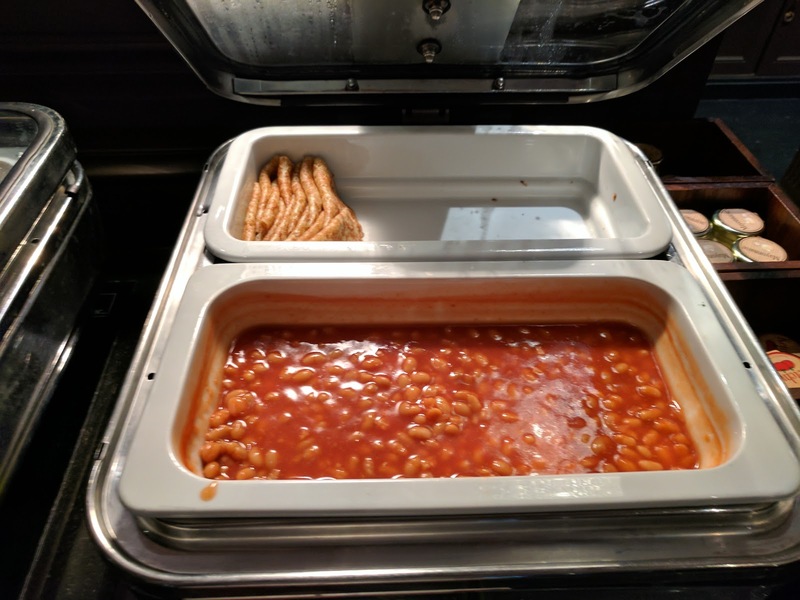 The portions are all full size. Oh, and they add in an amuse bouche, generous bread basket, and mignardises. That's right, they don't skimp on the extras just because you are doing the "cheap" option. So they must make up for it by upselling the drinks? Well, nope. A red, white, and rose wine of the day are all offered, in the very reasonable 9-12€ per glass range. They gladly served tap water. Everyone seated around us also ordered the lunch menus. I didn't see a single dish go by that came from the a la carte menu, although the full menu was available. For context, the regular tasting menu is 179€, starters range from 33-59€ (excluding the 88€ caviar), mains are 44-79€ (not counting the 158€ turbot for two), or you can design your own degustation from the small plates menu, where everything is (30-40€), and the portions really are small. So yes, this is an incredible deal. The food was incredibly solid. The starters and desserts in particular were elaborately plated, and, even though we didn't love everything we ordered, that was mostly due to what the dishes were, rather than any shortcomings in execution. The kitchen showed talent all around. 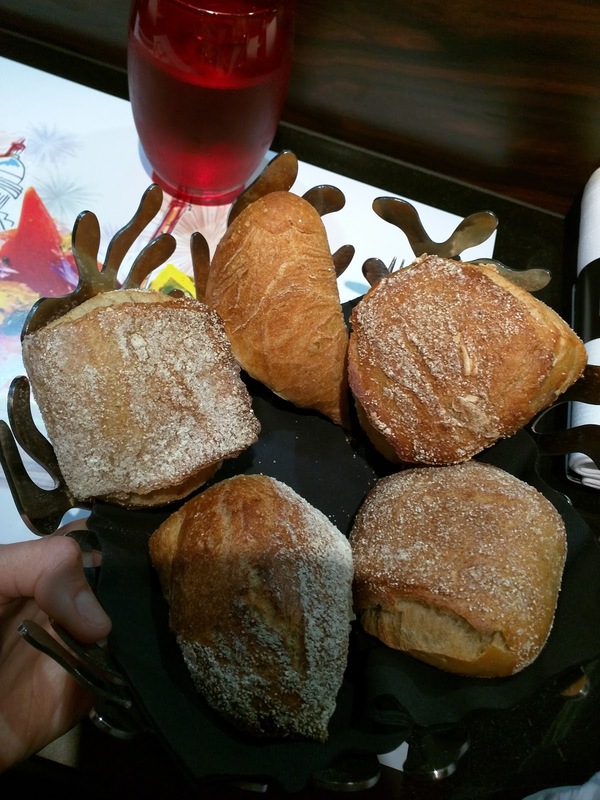 Once we placed our order, a bread basket was quickly placed before us. 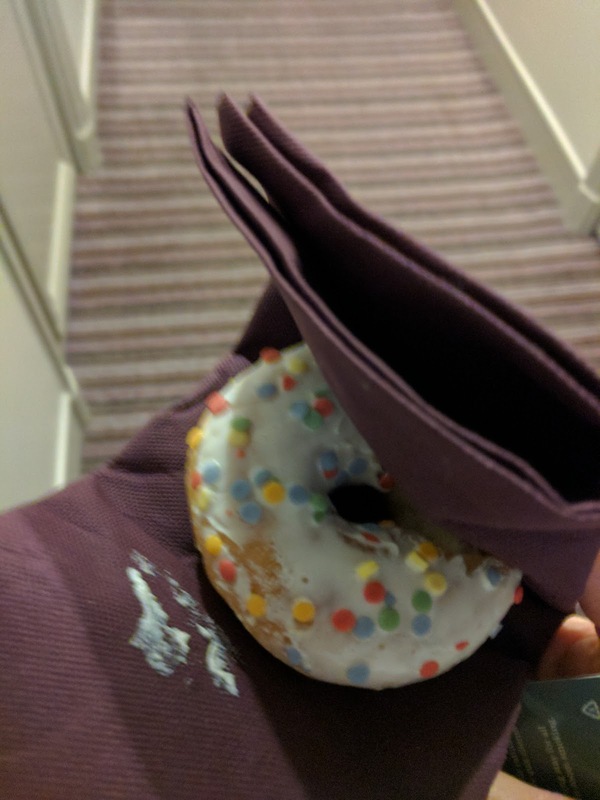 Inside were 5 rolls. Strangely, 4 were the same, and one was different. Like all L'Atelier locations, the bread was served cold, and without butter or oil. The folks next to us requested butter, and it was provided. I previously found that I never really cared about having oil or butter, because I knew the dishes would have sauces that I'd want to soak up, and the bread would be perfect for that. The 4 rolls were rustic style and ... sourdough. Sigh. Not in San Francisco, and still, the sourdough follows me? I don't like sourdough! It had a good crusty crust, soft and fluffy inside, but still, sourdough. The odd one out wasn't sourdough, so I claimed it. I wasn't thrilled with this bread basket, particularly when compared to the incredible fluffy croissant-like roll I loved at the Tokyo outpost (served with super cute petit pan a l'âme erre and petit baguette too), or even the kinda lackluster bread basket at London location (it had sliced bread!). But I wasn't there for the bread, so I didn't really care too much. Very soon after the bread basket, an amuse bouche was presented. I somehow didn't get a photo of it? I'm losing my touch! Anyway, it was a fried little red quinoa ball, filled with a creamy puree of some sort. It was crazy crispy on the outside, since it was fried and the shell was made from quinoa, and the inside was warm and creamy. A great little bite, full of contrasting textures, and it actually had some spice to it, so there was some kick too. My palette was quickly awoken, job done! Starters were broken into two sections, hot or cold, with 3 choices each. For cold, there was haricot vert salad, octopus carpaccio, or tomato gazpacho with burrata (a 12€ supplement). For hot apps, there was an artichoke dish, a poached egg and mushroom dish, and crispy fried shrimp (also a 12E€ supplement). I was tempted by the gazpacho because I love burrata, but, decided it wasn't worth the 12E€ when I was choosing this place based on value. After I saw the poached egg dish get delivered to a few other diners, I wished I had picked it. I don't like eggs really, but it was in this amazing mushroom veloute, and when the yolk burst open and mixed in it looked so luxurious! That left the octopus carpaccio, and the haricot vert salad or artichoke. I gladly opted for the octopus, and Ojan went for the hericot vert. "Poulpe en carpaccio, marinade minute aux épices douces et citron vert." 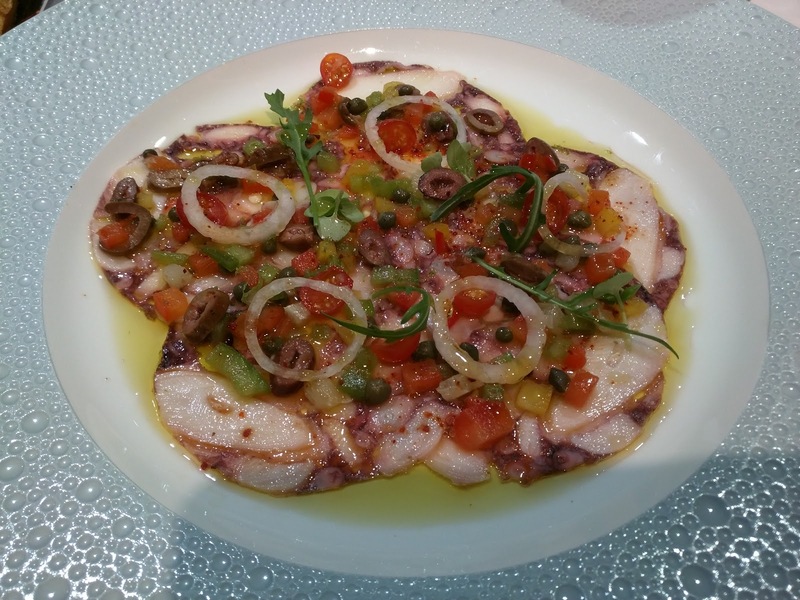 I went for the octopus carpaccio. I love octopus, but so often it is poorly cooked, rubbery, and either fishy or flavorless, so I don't get it often. 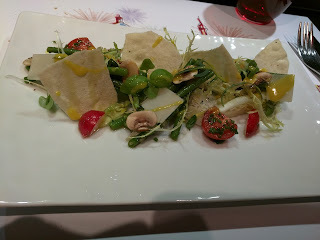 I felt confident in ordering it at L'Atelier de Joël Robuchon though. When my plate arrived, I actually just took a few minutes to take it all in. Since it was a cold dish, I was in no rush. And honestly, I was stunned. I've been to plenty of Michelin starred restaurants. I'm familiar with elaborate plating. But the level of perfection shown here was just extraordinary. Every single element of the dish was so, so precise. The overall shape was sorta a rounded star, or flower perhaps, with 5 bulbs to it. 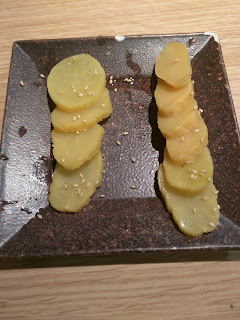 Mirroring the round shape, in each of the 5 sections, was a thin, round slice of white onion. The dice on the bell peppers, of multiple colors of course, was perfect as expected, and the same size as the capers. Bigger were the small halves of tiny tomatoes, each the size of a slice of olive. Wow. This was the most stunning octopus carpaccio I've certainly ever encountered! Once I finally broke out of my trance, I tried it of course. It was as amazing as it looked. The octopus was insanely thin slices, pressed together to form the elaborate base. Tender, not fishy, really perfectly prepared. The assorted vegetables added tons of flavor. Seriously, this was a flavor powerhouse, which I didn't expect, given the fairly simple list of ingredients. It was however drowning in oil. The oil enhanced the flavor for sure, but, there was too much. I gobbled up half the plate immediately, as it was so insanely delicious, and then took a moment to reflect. Once I went back in, I was put off by the oil. Too much, and it did sorta spoil the dish. But really amazing prep work and presentation, clearly a well crafted dish. Ojan appreciated the extra oil, and used it with his remaining bread, since the oil was super flavorful. "Méli-mélo de salade, copeaux de parmesan à la carta musica." Ojan opted for the green bean salad. Yup. I was kinda amused by the choice, but he doesn't like mushrooms, and actually wanted something light. Like my dish, his was a sight to behold. This was particularly amusing given that they call this a "méli-mélo de salade", that is, a hodge-podge. Does this look like a hodge-podge to you? His was a dish I watched the salad cook make a few times, so I knew exactly what went into it. You can't see it well here, but the green beans were gathered in bundles, three groupings of them. There were a few slices of mushroom, honestly the thinest slices I've ever seen. Tiny chunks of radish. Itsy bitty tomatoes, that had individual dabs of dressing on them. Parmesan cheese slices, that we saw the chef creating with a peeler, one at a time. Of course, unlike me, Ojan didn't sit there admiring it for a few minutes first, and actually just ate it. His review? It was light and fresh, pretty, well prepared, but not particularly interesting. The dressing was dijon vinaigrette. I did try a tomato, when Ojan repeated a couple times that the tomatoes were really good. For him to volunteer extra review material is a rare thing, so I knew it was meaningful. And indeed, wow, that was an amazing tomato! My dish had tomatoes too, but they were actually different (mine were smaller). Seriously, such a flavorful tomato, and, perfectly seasoned. It really seemed like the chef had put a few individual granules of salt on it specifically. Remember what I said about precision? For a green bean salad, this was quite the salad, but, it really wasn't the most exciting dish. Moving on to mains, we again had plenty of options. There was a single vegetarian option (risotto), four seafood options, and three meat. I quickly looked past the meat options (veal, beef, duck), and honed in on the seafood. For an additional 12€, there were two options: lobster spaghetti or john dory. Opting not to pay extra, I moved on. Another choice was a full, fried whiting. I had seen photos of this, and while impressive, I didn't really feel like dealing with a whole fish. Thus, the final seafood option it was: cod, a fish I always love, and we don't have in San Francisco (since it is an Atlantic fish). Ojan basically wanted all the mains. He asked the server for a recommendation, and she said that the duck is their most famous dish, so she pushed him towards it (along with several other diners, all of whom I saw ask the same question. She was clearly used to this. Perhaps she has stock in a duck farm?) After we saw the other meat options go to nearby diners, I must say I was jealous. The steak looked good, a thin style, but beautifully cooked. And the veal, which Ojan decided against as it was a cold prep and this sounded a bit odd, came with the most fascinating sides ... a cone of matchstick frites, lettuce wraps, and toast points. I saw the sides get delivered to several other diners, and eventually asked what dish they came with, because I couldn't figure out what on earth went with those three items together. Anyway, cod and duck it as for us. The plating of these dishes was nice, but no where near as elaborate as the starters (or soon, desserts). "Dans un bouillon épicé au gingembre frais." The portion was insane. I would have thought this was a large piece of fish under any circumstances, but as part of this value lunch menu it was even more incredible to me. 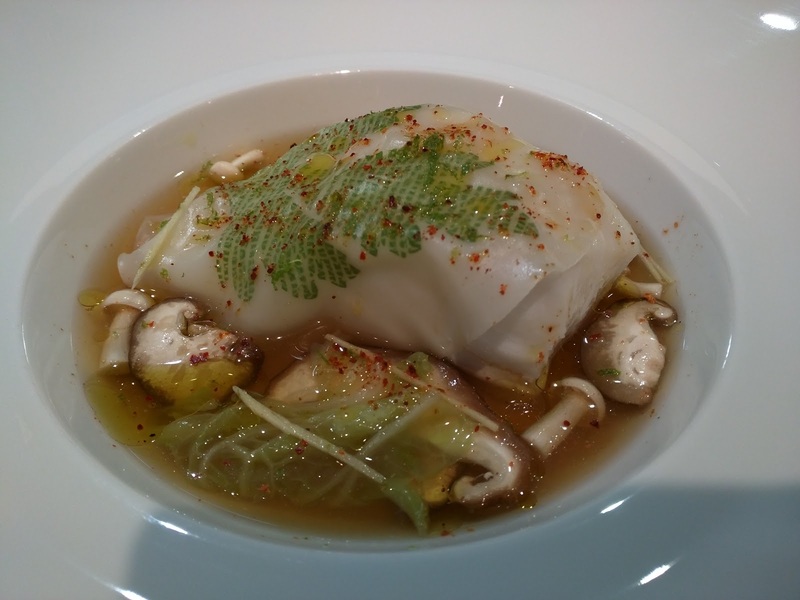 The cod was moist, mild, delicate, flaky. Expertly cooked, you couldn't have asked for anything different here. Of course, normally I prefer my cod baked with a coating, or fried, and served with tartar sauce, so this was quite different. It was a very light dish. On top was ... a noodle? It took me a while to figure out what it was, but yes, it seemed to be a rice noodle with a leaf printed on it in green. I can't say I really understand this, but I broke it up a little in the broth, which turned it into a noodle soup almost. Speaking of the broth. It was really incredible. So much flavor in here. So many aromatics, including the prominent ginger, slightly spicy. I couldn't stop lapping the broth up. Floating in the broth was a bit of lettuce and two types of mushrooms, some sliced, some just tiny. The vegetables went perfectly with the broth. It was finished with a sprinkle of a red spice, and a drizzle of oil. This was a fairly light dish, but given the size, it was very filling, particularly as part of a multi-course meal, at lunchtime. I really enjoyed both the fish and the amazing broth with vegetables in it, and would certainly recommend it. "En aiguillettes, aux cerises et amandes fraîches." 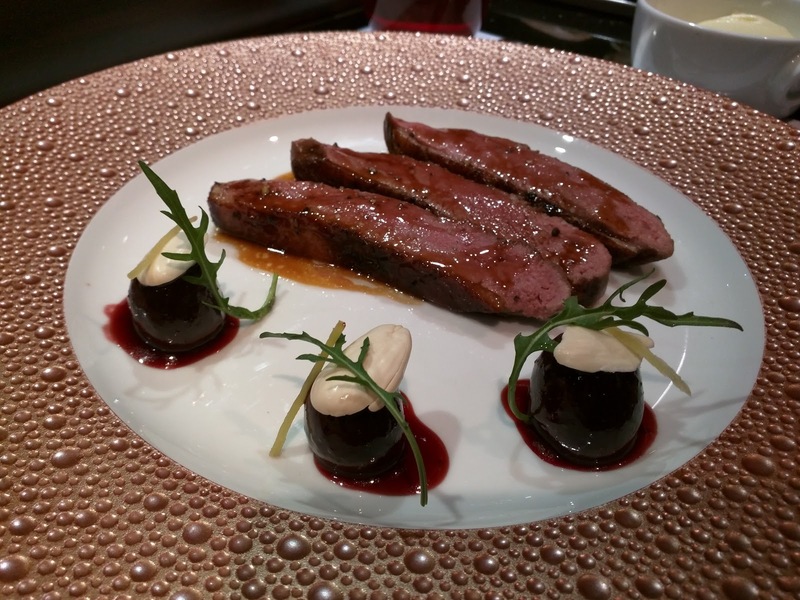 Ojan's dish was more dainty, three slices of duck, with three almond topped cherries. I don't like duck, and didn't want to try this, but Ojan insisted, saying I'd like it. I didn't. Yes, the duck was tender. 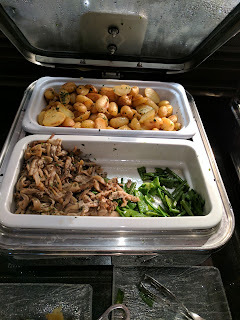 It was cooked medium, as Ojan had opted for (they asked how he wanted it cooked, he said however the chef recommended). But I didn't like it. He didn't either really, but was glad to have tried something different. Given what I saw of the other dishes, I think he would have liked the beef the best. While we were dining, the woman next to us asked if they could also somehow have a side of the pommes puree. 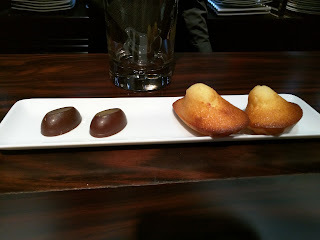 She tried explaining these to her date as life changing mashed potatoes, and I enthusiastically agreed, as I had them at the London L'Atelier de Joël Robuchon, and remembered them fondly. 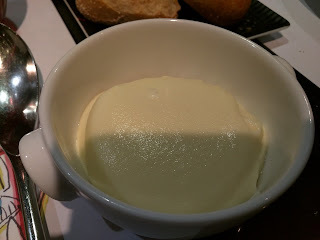 I set about telling Ojan all about the pommes puree too, and, when our main dishes showed up, so did some pommes puree. And not just one small side serving, two bowls, one for each of us. For the uninitiated, these are pretty famous potatoes. Just search for "Joël Robuchon mashed potatoes", and you'll find more material than you care to read about them. What makes them so famous? Well, for starters, don't bother call these mashed potatoes. You don't need to speak French, but at least call it potato puree. Mash it is not. You don't want to know what goes into these potatoes, from a nutritional, or labor aspect. Some spoilers though? 2:1 ratio of potato to butter. No joke. And they get passed through a ricer. And a sieve. The process takes many steps. But the result is indeed incredible. It is impossible to describe the texture. You have never had potatoes this creamy and smooth. And the flavor is so rich, that you likely wouldn't know it was potato. Delicious, insanely creamy, but oh so rich. Did it go with my delicate fish? Well no. But that didn't stop me. I did actually try dunking a spoonful in my broth, and that was surprisingly tasty, almost like a light gravy with the potatoes! We appreciated the bonus dishes, again, a complete surprise as this price point. And finally, time for what is often my favorite part of a meal: dessert! Except, at Joël Robuchon, I actually wasn't really looking forward to dessert. 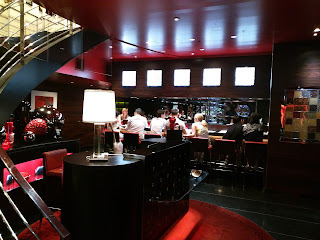 The desserts were all pretty weak at every other Joël Robuchon establishment I visited. When I was in London, I didn't even bother ordering dessert, the menu was that unappealing. And to be honest, I wouldn't have ordered it here either, if it wasn't included. We had the choice of a cheese plate, or three sweet options. One was inspired by coffee, one was lemon, and one was apricot. Cheese is never my dessert of choice. Both Ojan and I really dislike lemon desserts. Ojan can't have any caffeine, and I tend to avoid it, but I still opted for the coffee choice given no better options. Ojan was stuck with the apricot. Desserts are ordered at the same time as the mains, since it is a fixed menu. They showed up with proper pacing after our main dishes were cleared away. The plating was just as exquisite as the starters. 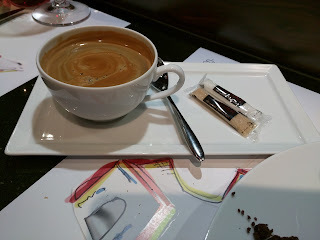 I always like coffee with my dessert, as I like the bitter pairing with a sweet dessert. Since we didn't actually order our desserts at the end of the meal, no server came to ask if we wanted more drinks either. I had to order the coffee when the dessert arrived, less ideal for me, but it was quickly delivered. My decaf Americano was fine. No strange decaf funk, not really remarkable though. Served with sugar and no creamer. I was glad to have it, but at €5.50 it was quite expensive compared to the meal itself, and even to coffee in other places I visited in Paris. "Gelée périe noire, chantilly gianduja, sable au chocolaté orange." I really had no idea what to expect with this dish, the server just told me it was a dessert inspired by, and used, coffee. Even once it showed up, I still had no idea what I was eating, although yes, most bits did taste like coffee. Starting with the center, a quenelle of ice cream, coffee flavored I guess. Creamy and smooth. Next to that were balls of a creamy mousse-cream (again, coffee?) coated with a layer of sweet ganache. The other cream was smaller puffs of what I guess was the gianduja chantilly, with discs of chocolate perched on top. Finally, some dark brown gelées, and a chocolate cookie crumble. The ice cream wasn't anything special. I didn't care for the gelée. The two creamy components were good enough, but not particularly interesting. I did like the chocolate cookie crumble; it was salty, and had some nibs in it. It was nice to have bites of cream and crunchy cookie, but, satisfying this was not. It did look lovely though. 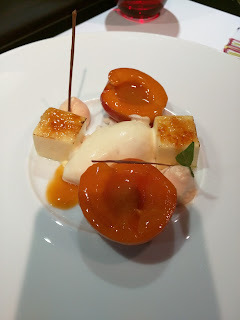 "Gâteau au formage blanc caramelize, glace à la verveine." And Ojan's option ... the apricot. Neither he nor I were excited about this, but the server did tell us it had cheesecake bites, which sounded like could be good at least. The "cheesecake bites" were the "gâteau au formage blanc caramelize", which, while yes, technically a "cheese" "cake", it certainly wasn't cheesecake. Instead, they were jiggly squares, most like a custard than a cheesecake. I didn't actually taste anything remotely formage blanc-esque. I did like the brûléed top though, a nice touch. Really, this was more of a play on crème brûlée than cheesecake. The star attraction was the apricot I guess. It was ... a whole apricot, cut in half, and glazed. Nearly impossible to cut into with the spoons we had. We had no forks nor knives, so this was really awkward. Ojan gave up after a few tries and just left it. The glaze was just sweet apricot puree. There was also a little orange colored cream, neither of us could identify that either, perhaps it too was apricot infused? And finally, in the center was a quenelle of ice cream. We didn't know what flavor it was, and I kept saying it was something Persian-like, perhaps cardamom? Or rose water? Or saffron? When I looked it up later, I learned that it was lemon verbena. I didn't really like anything about this dessert. While mine had some redeeming qualities, this one really didn't. Neither of us bothered finish it. And finally, a little platter with mignardises. Again, even with a 3 course lunch menu, these elements were included. I'm never a fan of madelines, so the madeline was entirely lost on me. I tried it, but yes, just a madeline. Ojan took a single bite and discarded his. The chocolates on the other hand were great. Ojan got to his first, and immediately proclaimed that I'd like it, telling me nothing else. Thus I was shocked when I bit into it, and the shell gave way to a smoothy, creamy salted caramel. This was quite good, so I managed to leave the lackluster dessert portion of the meal very happy. Bonus migs for the win!